"HIGHEST RETURN ON EQUITY OVER THREE YEARS (JOINT WINNER): HEALTHCARE: Hartalega Holdings Bhd - Stellar Return On Equity Despite Earnings Pressure | The Edge Billion Ringgit Club 2018"
Hartalega Holdings Bhd is the first glove manufacturer to be a component stock of the benchmark FBM KLCI, even though is not the biggest player in the industry in terms of sales and capacity. Its share price has outperformed the benchmark index, nearly tripling from RM2.03 on June 30, 2015, to RM5.99 on June 29, 2018, representing a three-year compound annual growth rate (CAGR) of 43.4%. And it has been keeping up the momentum, reaching an all-time high of RM7.23 on Aug 28, giving it a market capitalisation of RM24.17 billion. The share price rallied even as earnings and earnings potential grew. Profit after tax (PAT) grew from RM232.8 million in FY2014 to RM283 million in FY2017, reflecting a three-year CAGR of 6.7%. Hartalega’s production capacity expansion came just in time to meet the rising global demand for nitrile gloves. Furthermore, the glove maker has been able to pass the cost increments to customers in the form of average selling prices. 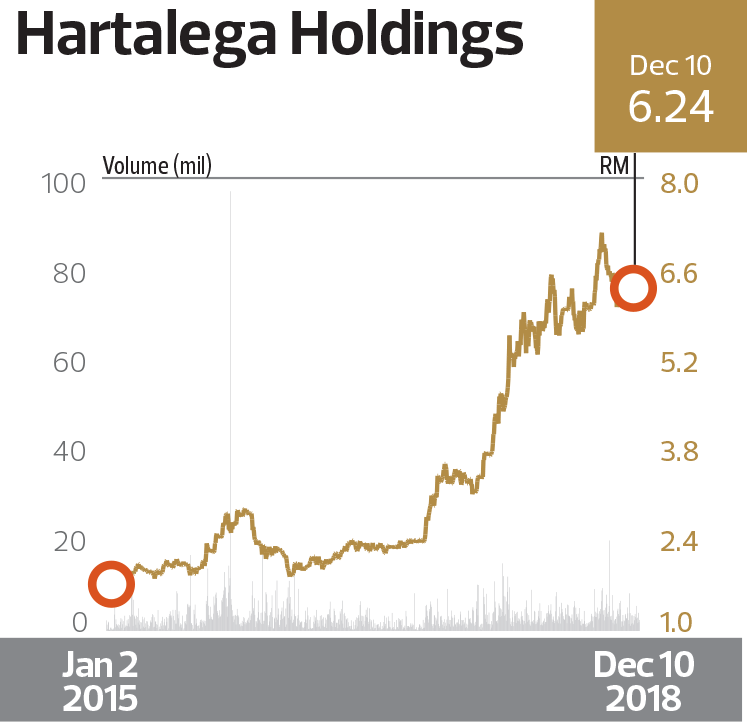 Hartalega’s return on equity (ROE) eased from about 25% in FY2014 to 17% in FY2017, even as its shareholders’ equity jumped from RM942.3 million in FY2014 to RM1.68 billion in FY2017. Based on the awards criteria, its adjusted weighted ROE over the three years was 18.3% — enough to make it a joint winner in The Edge BRC’s highest ROE over three years for the healthcare sector. To reward its shareholders, Hartalega has a dividend policy to pay out 45% of its annual net profit. The group has declared total dividends of 8.5 sen for FY2017, representing a payout ratio of 49.3%, compared with eight sen in FY2016 and 13 sen in FY2015. According to its 2018 annual report, the group has committed to a capital expenditure of RM403.3 million and will continue to expand its production capacity via its Next Generation Integrated Glove Manufacturing Complex (NGC). Once the NGC is completed, Hartalega’s total installed capacity will increase to over 44 billion pieces a year. Kuan also noted that Hartalega is in the process of upgrading its enterprise resource planning (ERP) system to reduce costs and wastage in its production process, as well as strengthen its operations and integrate automation across its supply chain. “We target to launch this group-wide ERP implementation project by end-2018, piloting at the NGC and subsequently rolling this out to our Bestari Jaya plants in 2019,” said Kuan. MIDF Research analyst Nabil Zainoodin comments that Hartalega’s prospects remain positive as global glove consumption remains healthy, growing at 8% to 10% annually. Moreover, he points out, Hartalega is currently working on securing the Federal and Drug Administration’s approval to increase its presence in the US market by the second half of 2019. “We like the stock due to its strong revenue growth, robust balance sheet and efficiency in production in comparison to its peers,” Nabil wrote in a recent note.